Sandy tagged me for the Sixth Picture Meme and I’m so glad she did. I took this photo last month when Dale’s friend Arthur was here. You see, Arthur lives in Hawaii but he comes home to visit his mom at least once a year and he always comes to visit Dale and I, too. This last time he visited he asked us for a special favor. He asked us to go bowling with him. It seems his friends in Hawaii have never heard of candlepin bowling and he wanted to bring home some photos to show them that yes, there really are teeny tiny bowling balls and tall skinny bowling pins. I was happy to bring my camera along and take some photos of moving objects. I learned a few new things about shutter speed and aperture that night and we had a lot of laughs while bowling, too. I’m betting some of you have never heard of candle pin bowling either. I think it’s pretty cool that playing along with this meme is also educational to my readers. I’m just here to serve, after all. It never quite seemed….right. Too small of everything. That’s the kind of bowling we have here! I prefer the smaller ball. Masshole that I am, I have NEVER gone regular big-ball bowling in my life – only candlepin. I went big-ball or regular bowling for the first time in college. It seemed like cheating somehow. You learn something every day. Look how tiny the balls are! So, is candlestick bowling the same as duckpins? It’s been so long i don’t remember exactly what the pins looked like. I loved playing candlepin when I was young….it was fun. I haven’t played though in YEARS. 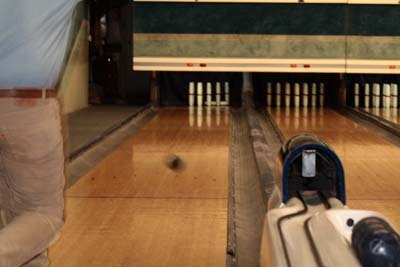 Is candlepin bowling harder or easier than regular bowling? It looks like fun! i grew up playing big ball bowling (heh big balls) — kid birthday parties and such — and i’m lousy at it. i’ve only been candlepin bowling a couple of times and i’m much better at it. Dang. Those are some skinny pins! I can’t even figure out which is my 6th picture folder. Never heard of it, until now. How interesting! a nice reminder of my younger days in Mass. I’ve never seen thast before. The pins look weird. My grandfather always used to swear that 10-pin bowling required no skill, but that candlestick and duckpin bowling needed a much finer touch. I’d never heard of candlepin bowling before – thanks for the link! FYI – A Canadian fact…we don’t commonly have 10 pin bowling here. We call our bowling 5pin….neat eh??? I had never heard of candle pin bowling until I moved here to NH – I think it is really cool! I didn’t know about candlepin bowling…until now! That’s a very cool shot! I forgot to tag five others in mine. Dang it. Oh, how I *heart* candlepin bowling. I haven’t done it in decades. Maybe next time I come to MA??? I haven’t done that in years. I have a hard enough time hitting regular pins with big balls though. while we don’t have candlepin bowling here, we’ve got that regular 10-pin stuff. I much prefer candlepin. those balls are far easier to throw then my 11+ pounder. My ex and I made sure we went candlepin bowling each time we were in Boston. We don’t have candlepin powling here in Baltimore, but we have duckpin bowling. Same shape pins as ten pins (which we also have) but they are smaller. And the balls look to be about the size for candlepins, as they are smaller that ten pin balls too. I think duck pins takes more skill that ten pins (candlepins probably does too), as the pinsa are farther apart and the balls have no set grip spots. But for me it is actually easier, because the balls aren’ nearly so heavy. Nope, never heard of it, but it sounds fun. Lighter balls would be easier on the hands. I grew up with it. I even watched Candlepins for Cash with Bob Gamere (he pronounced it Gameah) when I was a kid. Am I dating myself? I’ve never bowled “candlepins” before, actually only faintly remember any reference to it. Looks like fun. If you don’t mind I’d like to post mine later this week! I’ve never seen it any of the other places I have lived around the country.